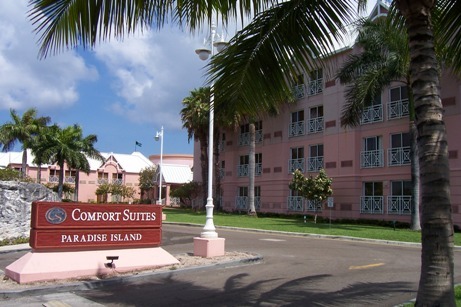 Despite not being located on the beach, Comfort Suites Paradise Island enjoys a prime location: across the street from the famous Atlantis Resort & Casino. Although it’s not considered part of the Atlantis Resort (yet), guests at Comfort Suites can use the facilities the pools, water rides, and other attractions. In addition, they can patronize the restaurants and bars in the same way that Atlantis guests do: by signing it to their room charges. When the Atlantis spectacle gets to be a bit too much, the Comfort Suites has its own pool and restaurant. In addition, it’s within easy walking distance of Anthony's Grill in the Paradise Shopping Village as well as the Bahamas Craft Center and the convenient, inexpensive Ferry to Nassau . One caveat: in May 2008, during a meeting at Harborside, Atlantis, one of the salespeople told me that the owner of Atlantis had bought Comfort Suites, among other properties. Right now, it’s too early to tell what’s going to happen to that area of Paradise Island.